After spending the next ten years developing his herd to well over 30 Alpacas Alan decided he needed some help. He decided to ask friends Alex Ilyat, a Vet from a local practice who had treated Alpacas during his career; and Ian Cooper, an electrician. Ian hadn’t ever seen an Alpaca before let alone considered his animal husbandry skills! Fortunatly the Alpacas have been patient and understanding. From this the Glynllethr Herd was formed. 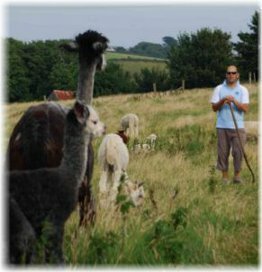 We hope this website will give you an insight into Alpacas, their care and some first hand veterinary experience. We will also be advertising our fleece products and any Alpacas we have to sell. We hope you enjoy following our adventure!